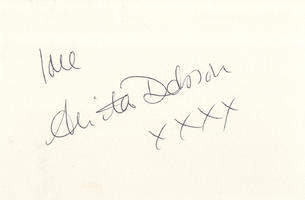 This is a Hand Signed White Card 6" x 4" by the English Television Actress who is best remembered for playing the part of Angie Watts in Eastenders. She is married to the Lead Guitarist with Queen, Brian May. Anita Dobson (born 29 April 1949, Stepney, London) is an English television actress and singer. She gained her highest profile while playing Angie Watts in the BBC soap opera, EastEnders.